Have you ever wondered what was under the knobs on your guitar? Why the signal cuts out when you move your cable? Why it crackles when you turn the volume or tone knobs? This hands-on workshop will answer all these questions and more. Discuss the components in a guitar’s electronic circuitry—pots, caps, switching options, pickup types—and how they all work together. Demonstrate soldering and do a hands on soldering session. This involves more than just learning to connect a wire to a lug. You’ll learn about proper use and cleaning of a soldering station, proper wire dressing, designing a clean layout for your wiring, how to secure leads and how to leave every joint looking like it was done by a pro. 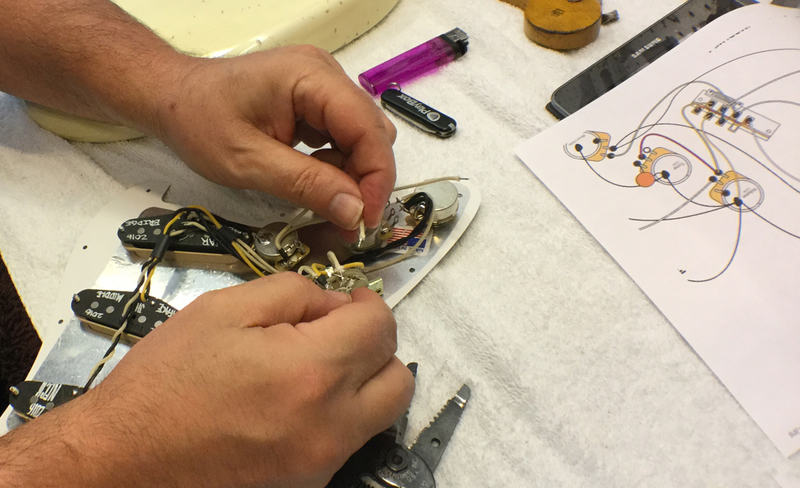 Design and install an electronics upgrade in your own guitar. Completely rewire your own guitar, or modify an existing circuit. Examples of possibilities—Wiring up a full Stratocaster pickguard, install the “Jimmy Page” mod in your Gibson or add a couple of push/pull pots to your Tele for series and out of phase options. Before the class, we’ll thoroughly discuss your project plans to be sure we have the correct components on hand and enough class time to have your wiring dream become reality. Each student will have their own fully equipped bench to work on – all tools are provided during the class. Our owner Geoff Luttrell teaches each class. Classes are limited to 4 people, so each student gets plenty of hands-on experience, and as much individual attention as possible. In my 25 years of playing amateur guitar, this is by far the best thing I’ve ever done. Hands down!! Glad i found SF Guitarworks and Geoff’s classes, it truly has been an eye opening experience, now I don’t have to throw away guitar parts or pickups if something breaks down, i can sit at home and fix it instead. Every serious/ semi-serious guitar player should consider taking a class or two here. I am looking to begin studying lutherie, for which I am eventually planning on going to school full time. I’d like to have as much information as I can coming in, so I’d love to be placed on the waiting list for your next electronics class. If you have any recommendations for local guitar building/repairing schools or classes, it would be greatly appreciated as well. I’m interested in the electronics workshop. I”ve got a Gibson SG circa 2000, (it’s a special) and I was thinking about upgrading pots, wires, tone caps and pickups. Would you let me know when you might have your next workshop?